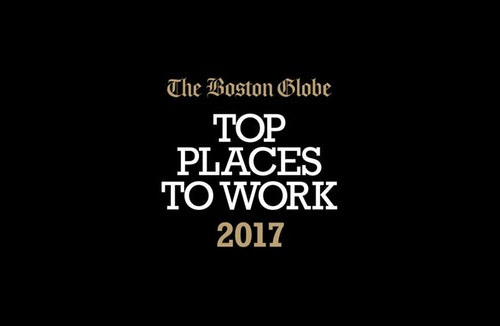 Braintree, MA (November 17, 2017) – Peabody Properties has been named one of the “Top Places to Work” in Massachusetts in the 10th annual employee-based survey project from The Boston Globe. 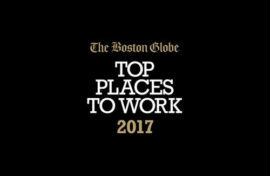 The “Top Places to Work 2017” issue was published online at Globe.com/topplaces on the night of November 16, and will be published in The Boston Globe Magazine on November 19. “Top Places to Work” recognizes the most admired workplaces in the state voted on by the people who know them best – their employees. The survey measures employee opinions about their company’s direction, execution, connection, management, work, pay, benefits, and engagement. The employers are placed into one of four groups: small, with 50 to 99 employees; medium, with 100 to 249 employees; large, with 250 to 999 employees; and largest, with 1,000 or more employees. Peabody Properties was ranked 19 (out of 35) in the large employer category. With more than 40 years of experience as a full-service real estate company, the name Peabody Properties, Inc. (PPI) is never far from top of mind. At the helm of PPI, company Principals Karen Fish-Will and Melissa Fish-Crane foster a culture of fun, diversity, and growth; a culture where people are valued, great work is rewarded, and professional development is encouraged through continued training and education. PPI’s own Peabody University, an in-house classroom, provides employees several options for enhancing their skills and aptitude. Peabody is committed to their employees and strives to foster a positive, supportive, caring, and enjoyable workplace. The rankings in the “Top Places to Work” are based on confidential survey information collected by Energage (formerly Workplace Dynamics), an independent company specializing in employee engagement and retention, from nearly 75,060 individuals at 334 Massachusetts organizations. The winners share a few key traits, including offering progressive benefits, giving their employees a voice, and encouraging them to have some fun while they’re at it. “Top Places to Work” online extras include sortable rankings and photo galleries. All can be found at globe.com/topplaces. Readers can follow the news on Twitter at #workboston.